Pre-heat the oven to 180°C. Heat a large roasting tin on top of the cooker. Heat the olive oil in the roasting tin and brown the veal shank well. Crush the garlic. Peel and chop the onion. Peel and slice the carrots. Slice the celery. Add these ingredients, the tomato paste and the chopped tomatoes to the roasting tin. Then add the sprigs of rosemary and thyme. Keeping the roasting tin on a high heat, pour in the veal stock and the red wine. Heat through, then transfer the roasting tin to the centre of the oven and braise the veal shank until its core temperature reaches 70-75°C. 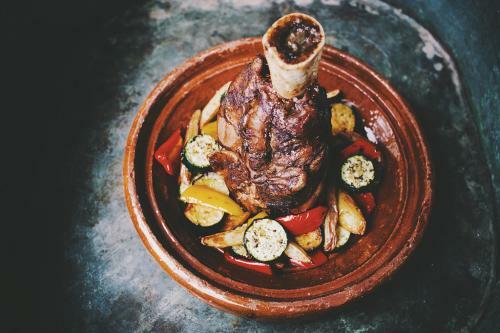 Serve the veal shank with roughly chopped roast or grilled vegetables, such as sweet pepper, courgette, aubergine and red or yellow-skinned potatoes.